About 70 members of the Valley’s Shevet Shemesh chapter frolic in the snow in Prescott as part of the group’s annual winter camp. Teens take part in the BBYO Mountain Spirit Convention 2018. The Spirit Convention is the first regional event of the new year and includes BBYO teens from Arizona. This year’s convention took place in Mesa from Jan. 19-21. In an effort to build a Jewish teen community across the Valley, Jewish News and The League present Teen Scene, featuring regularly scheduled content devoted to teen programming. Here is a roundup of recent and upcoming events for Valley teens. It was a busy few weeks for the 70 members of the Valley’s Shevet Shemesh chapter. First, the group traveled to snowy Prescott for its annual winter camping trip (themed “The Amazing Race”) and then jumped right into Tu B’Shevat. Scout members got to craft Tu B’Shevat packages for their families. The packages were filled with dried fruits, decorative accessories and much more. The Friendship Bakery is a social enterprise for adults with special needs. The program enables participants to learn aspects of the food service industry, while having fun and building friendships. Sunday Circle: In a group setting and with professional instructors, teen volunteers and their buddies develop friendships through art, music and physical fitness. For more information on all events, call 602-680-8382. Hebrew High Care-a-Van Informational Meeting for Parents and Teens: 4- 5 p.m., Ina Levine Jewish Community Campus, BJE Room 101, 12701 N. Scottsdale Road, Scottsdale. Care-a-Van is a 15-day summer excursion that brings Jewish teens together for meaningful Jewish learning, community service, socialization, spirituality and travel. This summer’s trip will take teens to Mount Rushmore and Yellowstone National Park. org. Video of last summer’s trip is at bit.ly/2G8d3ZF. RSVP to myras@bjephoenix. Israel Experience Prep: Traveling to Israel this summer with your youth group or summer camp? This Tuesday-night class at Hebrew High is for teens applying for a Grossman Incentive Grant for a Teen Israel Experience. The Israel Experience Prep class is a seven-week course that will prepare you for your travels. A summer Israel experience is an in-depth exploration of your Jewish roots in the land of Israel. The more you know before your trip, the more you will absorb and appreciate while in Israel. The class meets from 8:05-9 p.m. For more information, contact myras@bjephoenix.org. The Jewish Community Foundation of Greater Phoenix hosts JSERVE: A Jewish Day of Service. Projects will be held in the afternoon after religious school. Teens in grades 7-12 are invited to join and help. For more information, contact Andrea Cohen at acohen@jcfphoenix.org or 480-699-1717. From 6-8 p.m., our 7th-12th graders will meet in the Or Tzion Youth Lounge to catch up with old friends and meet new ones. Join us for activities and fun! RSVP: tinyurl.com/OTfeblounge. From 5:30-7:30 p.m., our Or Tzion youth group chapter will attend the congregation-wide DIY Purim celebration. RSVP: tinyurl.com/DIYPurim. All events take place at Congregation Or Tzion, 16415 N. 90th St., Scottsdale. Make sure you stop by for our Sunday meets from 9:30 a.m.-12 p.m. at the CTEEN Club at Chabad of the East Valley, 875 N. McClintock Drive, Chandler. You can socialize, learn and volunteer to help younger children learn and create as well. For more information, call Rabbi T at 480-410-1440. 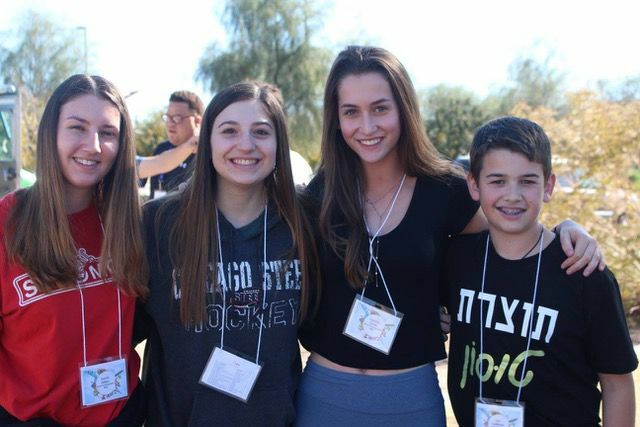 JSU Shabbaton weekends inspire and educate teens in an atmosphere of Jewish pride and growth. They provide a unique opportunity for both public and private school students to interact together and explore what their Judaism means to them in a traditional Shabbat environment. JSU schools will come together for a Shabbat program of dinner, games, group activities, meaningful sessions and more. We will also welcome two of our fantastic JSU advisors for the weekend. On Saturday night, have some fun at a local Dave and Buster’s. All meals and activities will take place at MAKOR, 3402 N. Scottsdale Road, Suite A120, Scottsdale. The cost for weekend, which included Saturday night’s activity, is $40. For more information, email shmuli@dojsu.org or call 201-362-2074. JSU season is in full swing with clubs meeting regularly at local high schools including: Acadia High School, Arizona School for the Arts, Brophy College Preparatory, Chaparral High School, Horizon High School, Phoenix Country Day School, Pinnacle High School, Saguaro High School, and Sunnyslope High School. JSU hosts Latte and Learning from 7-8 p.m. on Wednesdays at the Starbucks near Paradise Valley Mall, 12802 N. Tatum Blvd. Join your friends, have a free cup of coffee on us and take in some meaningful Jewish learning. In Scottsdale, BBYO chapters meet at 7 p.m., Mondays, at the Valley of the Sun JCC, 12701 N. Scottsdale Road, Scottsdale. For more information, email mtn@bbyo.org.